Mike Babcock addressed the media after his team’s practice on Wednesday, one day out from the series opener against the Boston Bruins. Establishing a forecheck and maybe getting a couple of wingers below the dots and creating and maintaining puck pressure — how will Boston make that challenging? What do you like about your team that might enable you to do so? Babcock: I just think whatever teams gets to spend more time in the offensive zone is then going to have better transition. That is probably where you are going to get really hurt. That’ll be a priority for both teams to put some wear and tear on the other team and spend some time in the offensive zone, so I don’t think there is a whole lot of secrecy about that. We’ve just got to do a good job. You’ve got two Stanley Cup champions in here but pretty much every one of your skaters have won something at some level — World Junior, World Championship. How important is that championship pedigree? 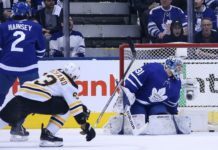 Babcock: I think it is real important. When you’ve won, you seem to know how to win. You know how hard you can play. There is a whole other level of hard. Once you figure that out that you can play at that level and sustain it for long periods of time, you’re more likely to get that done. I think that is an important thing. The guy’s who have won, I think it is different than having management who has won or anything like that. The players on the team that have won can really help the guys who haven’t. It makes for important guys that are additions to your club. We talk about the pressures of the players — what is it like for you going into this in year four? Babcock: It’s a riot, to tell you the truth. It is as much fun… I was saying to my wife two days ago it is as much fun as I’ve had in three months, the other day. Getting prepared is important. When I look at what we were able to do here, I’m obviously real proud of where we are at and where we are going. The Maple Leafs…. When they told me the other day that the Maple Leafs didn’t have back-to-back 100-point seasons in their history, I couldn’t believe it. It just goes to show you we are going in the right direction and we think our players are getting older and better. Our kids are real important to us and that’s important to us as well. In the end, this time of year is what it is all about. Pressure is a privilege and pressure simply means that you have a chance. If you have no chance, there is no pressure. Much rather have a little duress for everybody. I think that’s where the fun is at. Babcock: There are always concerns, but what you do is you get up and you move on and you try to get better. I actually think the bumps we had… We had a period of time where it didn’t go good defensively. We had a period of time where it didn’t go good in the net. We had a period of time where we didn’t score at the best rate. I think those are all good things for our team. Any way you look at it, we can say whatever we want, when you look at it, we are a real good team in the NHL and we are a team that has gotten better and better and better. And we are going in the right direction. You’ve used Tyler Ennis and Trevor Moore on that fourth line. How has Moore worked his way into that spot? Babcock: Just real competitive without the puck. Real strong on it. Excellent details. We just think that he has helped out. He is a guy who can play in all situations if we need him. We like what he’s done for us. How do you find that line between hard line matching and maybe letting the bench flow and letting guys get into things? Babcock: That is a real good question. In our situation now, it is a little bit different than it was just because we have two groups there and a third group that we are not as concerned about. I think that makes it easier for sure. I think at home, though, you can still do things without disrupting your flow. On the road, sometimes you can get in your own way. The guy who is leading is always in charge. If you are chasing the game, it is harder. The other guys gets to do whatever he wants. If you are ahead in the game, you get to do what you want because he has to get certain people on the ice. How does the energy of the group change when guys like Muzzin and Hainsey take on leadership roles? Babcock: I just think in general those guys are good leaders on and off the ice. They’re committed to doing things right. They’ve had success. They’ve won and they know what it takes. We’ve talked about that already. I think that is important. Leadership, in the end though, has nothing to do with what you say. It is what you do and what you model and your compete level at this time of year is so important. Those guys do that. How much confidence do you expect Tavares to bring into a playoff series coming off of the career season that he’s had? Babcock: We talked about that with our guys, too. I said this the other day: Lots of times you have a career year and if you go two years without scoring, everyone is all over you. Just play well. Don’t read any of the news. Just play well. Keep doing it. Be patient. Stick to your game and everything will turn good. He’s been really good and he’s gotten better and better defensively for us, which is real important for our team. His line is a good line. They’ve been a real factor in our year and he knows how to score playoff goals. That is what he scores anyway by standing in the blue paint, so it shouldn’t be a big adjustment. Connor Brown didn’t score probably the way he would’ve liked, but he is a good soldier for you…. Babcock: He’s an important guy and he’s an important guy at this time of year. He knows how to play. I’ve talked to Brownie a lot about that — climbing all over the goalie, being relentless, doing a good job getting second chances, but at the same time, taking care of defense. I think that is absolutely critical for everybody. You have to be patient. You are going to get your chances. There are going to be times where they are going to outplay you. Just relax. There is going to be a time where your power play doesn’t work or your penalty kill doesn’t work. Just keep on keeping on and keep grinding. We are looking forward to a game tomorrow. We’ve had three days of press conferences without having anything to really talk about. Now we are going to have something to talk about. It’ll be good.